New data released by FIFA today has revealed that Russia 2018 was the most engaged FIFA World Cup™ in history. 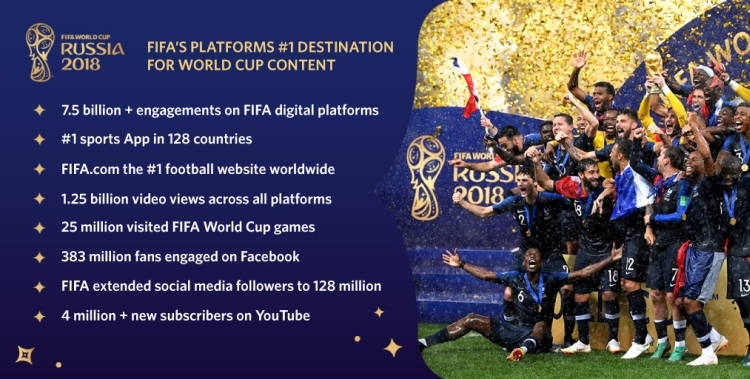 Record-breaking interest from fans online resulted in over 7.5 billion engagements across FIFA digital platforms during the World Cup. New digital innovations and initiatives introduced by FIFA including a new bespoke app, broader and more interactive coverage on social media, dedicated reporters for the 32 competing teams and an innovative new visual stories approach played a key role in giving fans more opportunities to connect, follow and engage with all the latest action and breaking news from across the tournament.